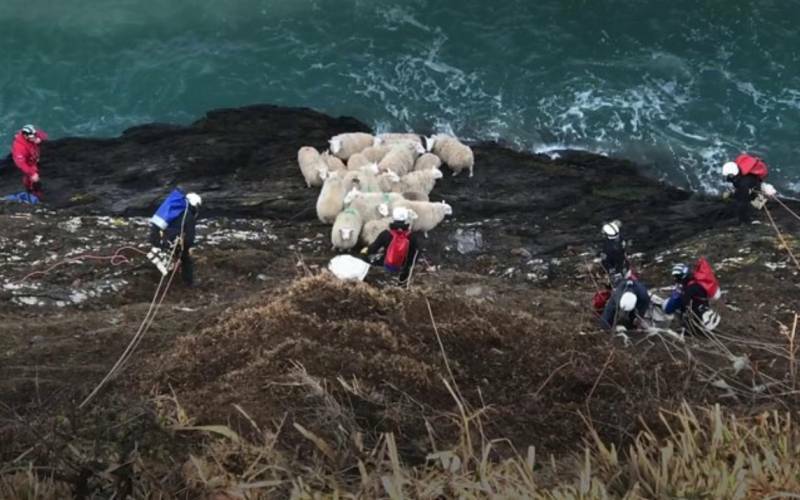 Rescuers have completed the 'most technical rescue' they have ever faced after saving 65 sheep from sea cliffs in Pembrokeshire. A rescue operation to safely remove a further 23 sheep trapped on sea cliffs in Pembrokeshire has been completed following a suspected livestock worrying incident. The operation began on Monday 1 April and has been described as the “most technical rescue”, involving 65 sheep which have been successfully rescued. The sheep were on cliffs around 70-80 metres high and had spread over a wide area in groups. It was thought that the large flock had been scared over the cliffs by a dog. The operation finished on Wednesday 10 April, after three RSPCA specialist rope rescue teams and two boat teams were deployed to Mathry to rescue the remaining flock of sheep. A mountaineering rope rescue expert also attended. These remaining sheep had luckily found their way to an area with some forage and had with recent rain had some moisture too. The operation saw 23 sheep rescued with 22 of them being taken via the rescue boat to shore and one was hauled up to safety by a rope rescue team. Last Monday (1 April) around 40 sheep were initially rescued using the boats, where the sheep were rescued from the bottom of the cliffs and on Tuesday three further sheep were safely rescued by the rope rescue team. Another sheep was then rescued on Friday, who had become stranded from the rest of the flock, and was stuck under a slab in a tiny sheltered cave away from any food. “This has been a long and difficult rescue and the most technical rescue we have had to deal with,” he said. The incident led the farming industry to urge people and dog walkers to take care around farm animals and ensure that their dog is kept on the lead at all times when in or near fields containing livestock.